Address: Argentina, 318, Costa Teguise (Lanzarote), Islas Canarias. Lanzarote Paradise is in a quiet area of Costa Teguise in Lanzarote. It offers 2 adults' pools, 2 children's pools and a free shuttle service to the town centre and Las Cucharas Beach. 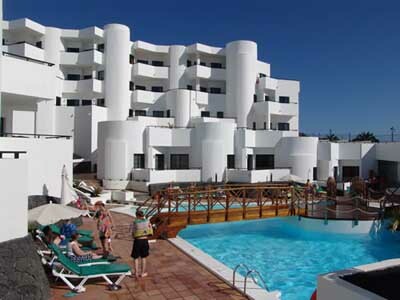 The apartments at Lanzarote Paradise feature a lounge with a sofa bed and a free HD TV. Each one has a kitchenette with a toaster, kettle and coffee machine. All apartments have a private balcony, many of which overlook the sea or the pool. There is a snack bar, and the Volcano Bar has pool, table football and ping pong tables. There is also regular live entertainment. Aquapark Waterpark, Costa Teguise Golf Course and Santa Barbara Tennis & Paddle Club are nearby. Central Arrecife is a 15-minute drive away, and you can drive to Lanzarote Airport in around 20 minutes. Please inform Apartamentos Lanzarote Paradise in advance of your expected arrival time. You can use the Special Requests box when booking, or contact the property directly with the contact details provided in your confirmation.